Cast members from the upcoming stage show of Buke of the Howlat at Brodie Castle, Moray. Picture by Jason Hedges. The historic grounds of a Moray castle will provide the stunning backdrop for the world premiere of a cherished Scots poem. The Buke of the Howlat has been enjoyed by generations since being written by Richard Holland on the Darnaway Estate, near Forres, in the 15th century. And now, the tale of a young owl who believes himself to be ugly will find new life as a theatrical production for the first time at the Findhorn Bay Festival later this month. 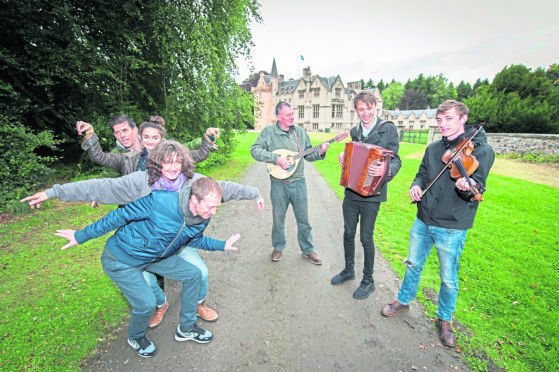 The audience will gather in the woods at Brodie Castle for the performance before sitting under the stars as the Howlat gathers birds from near and far to hear his plea. Writer Morna Young, from Burghead, has endeavoured to keep the stage adaption true to its Scots roots to showcase the language. She said: “The Buke of the Howlat is a special work with much local relevance. “In this theatrical adaption, I’ve tried to create a piece that both honours the original poem’s essence while translating it for a contemporary audience. The Howlat gained new attention two years ago when it was adapted into a children’s book written by James Robertson. Cast members have been recruited locally from open auditions to contribute to the stage production. Director Ben Harrison has promised singing and dancing in the spectacular show. The production is just one event at this year’s festival exploring whether Scotland is a multi-lingual nation. Festival director Kresanna Aigner said: “Gaelic and Scots are integral to our heritage and creativity yet a sense can be felt that the traditional tongue is fading away. “In recent years, schools have been encouraged to increase the use of Scots in education so incorporating the aspect of language into the festival is timely. The Buke of the Howlat will be performed at Brodie Castle from September 27 to October 1 daily at 7.30pm.